Posted: Friday, December 1, 2017. 6:11 am CST. 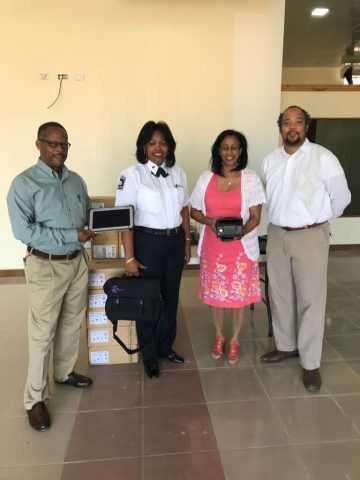 By BBN Staff: The Ministry with responsibility for Immigration and Refugees received six MIDAS mobile readers from the United States Embassy in Belize on Wednesday, November 29, 2017. According to a release from Government’s Press Office, the donation was presented by Steven Davis of the Bureau of International Narcotics and Law Enforcement Affairs Specialist at the Embassy of the United States of America in Belize. The readers are valued at approximately BZ$72,000 and receiving on behalf of the Government of Belize were: Beverly Williams, Minister of State in the Ministry of Immigration, CEO in the Ministry of Immigration Edmund Zuniga, Director of Immigration and Nationality Services Diana Locke, and Assistant Director of Immigration and Nationality Services Debra Baptist Estrada. The mobile readers will be used to capture immigration information at established and informal border entry/exit points.